In Mineral blue with black leather interior. A very smart and rare MGB GT automatic that was restored some years ago and is in excellent order. A garage owned the GT from 1993 until 2011. They had the bodywork refurbished with a new wing and various panels, and a complete respray in Mineral Blue. They overhauled the ingnition and brakes, rebuilt the carburettors, fitted a stanless exhust and had the cylinder head converted for unleaded petrol. Numerous other small items were attended to as well. They used the car sparingly - it only covered less than a thousand miles during their ownership. The bodywork and underside are in very good order and still look very smart with a deep sheen to the paintwork. The interior is lovely with little or no wear and the engine bay is detailed. 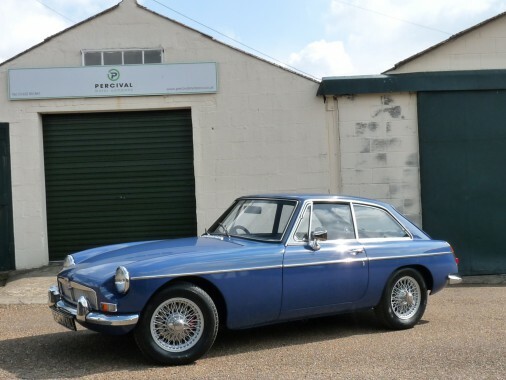 MGB GT automatics are a rare car and the gearbox suits the leisurely nature of the engine. It cruises along nicely and will nip up to 70 mph if need be.